Dr. Carin Sanchez was born and raised in Metairie, LA. She attended the Academy of the Sacred Heart for 13 years. After graduating from Sacred Heart, she attended Emory University in Atlanta, where she received a Bachelor in Science in Biology. After graduation, Dr. Sanchez worked for two years for the Department of Psychiatry at Emory doing research on depression and anxiety. Dr. Sanchez then moved back to New Orleans to attend the LSU School of Medicine. It is here that she met her husband, Dr. Trey Sands. They moved to Houston for training purposes. 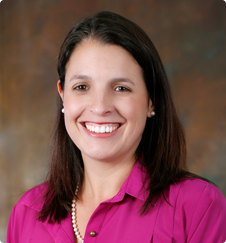 In 2008, Dr. Sanchez completed her training in Internal Medicine and Pediatrics and decided to stay on another year as Chief resident at the University of Texas. She is Board Certified in Internal Medicine and Pediatrics. Dr. Sanchez moved back to New Orleans, where her husband completed his training at Tulane University in Plastic Surgery. She worked in the student health clinic at Tulane University for two years and then transitioned to a hospitalist practice at East Jefferson General Hospital where she worked for over four years. It is during her time as a hospitalist that she began to dream of a practice that allowed her to treat patients the way they deserve to be treated. The approach at Vieux Care is to build long lasting relationships with their patients, and bring medicine back to how it was intended to be practiced. By removing the burdens placed by insurance companies and government regulations, they can focus solely on their patients’ needs. This has been her lifelong dream. When she is not working, Dr. Sanchez spends most of her free time running around after their three very active and very sweet boys.